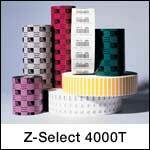 The Z-Select 4000T (formerly Trans Matte 2000) is a bright white, ultra-smooth, matte coated thermal transfer paper label. It's general-purpose, permanent, acrylic-based adhesive offers high initial tack and adhesion on corrugated packaging. Recommended for a wide variety of applications, such as shipping, receiving, and work-in-progress labels. Use with wax or wax/resin ribbon. 1.50" x 1.00" thermal transfer label on a 3" x 8" core. 5180 labels per roll / 14 rolls per case. Zebra 72280 special features - Non-perforated. Use with wax or wax/resin ribbon. 2.00" x 1.00" thermal transfer label on a 3" x 8" core. 5180 labels per roll / 10 rolls per case. Zebra 72281 special features - Non-perforated. Use with wax or wax/resin ribbon. 2.25" x 0.75" thermal transfer label on a 3" x 8" core. 7995 labels per roll / 4 rolls per case. Zebra 800622-075 special features - Perforated. Use with wax or wax/resin ribbon. 2.25" x 1.25" thermal transfer label on a 3" x 8" core. 4240 labels per roll / 8 rolls per case. Zebra 72283 special features - Non-perforated. Use with wax or wax/resin ribbon. 2.25" x 1.25" thermal transfer label on a 3" x 8" core. 5087 labels per roll / 4 rolls per case. Zebra 800622-125 special features - Perforated. Use with wax or wax/resin ribbon. Save $5 and get 5152 more labels with our BCW brand! 2.25" x 2.00" thermal transfer label on a 3" x 8" core. 3292 labels per roll / 4 rolls per case. Zebra 800622-205 special features - Perforated. Use with wax or wax/resin ribbon. 2.75" x 1.25" thermal transfer label on a 3" x 8" core. 4240 labels per roll / 8 rolls per case. Zebra 72282 special features - Non-perforated. Use with wax or wax/resin ribbon. 3.00" x 1.00" thermal transfer label on a 3" x 8" core. 5180 labels per roll / 6 rolls per case. Zebra 72284 special features - Non-perforated. Use with wax or wax/resin ribbon. 3.00" x 2.00" thermal transfer label on a 3" x 8" core. 2740 labels per roll / 6 rolls per case. Zebra 72285 special features - Non-perforated. Use with wax or wax/resin ribbon. 3.00" x 5.00" thermal transfer label on a 3" x 8" core. 1100 labels per roll / 6 rolls per case. Zebra 72993 special features - Non-perforated. Use with wax or wax/resin ribbon. 3.00" x 6.00" thermal transfer label on a 3" x 8" core. 910 labels per roll / 6 rolls per case. Zebra 81397 special features - Perforated. Use with wax or wax/resin ribbon. 3.25" x 2.00" thermal transfer label on a 3" x 8" core. 2700 labels per roll / 6 rolls per case. Zebra 72974 special features - Non-perforated. Use with wax or wax/resin ribbon.